Seagate’s latest foray into the world of SSDs has resulted in the Seagate Pulsar drive, making it the first product in its new enterprise solid state drive (SSD) family. The Pulsar was specially designed for enterprise blade and general server applications, where it relies on single-level cell (SLC) technology to deliver up to 200GB capacity. Despite all the storage space within, it was built in a 2.5-” small form factor with a SATA interface. The Pulsar SSD is no slouch when it comes to high level performance that many companies and organizations ask for, where it delivers the necessary performance, reliability and endurance which are able to match the application environments of enterprise blade and general servers. Capable of hitting a peak performance of up to 30,000 read IOPS and 25,000 write IOPS, 240MB/s sequential read and 200 MB/s sequential write, the Pulsar’s SLC-based design helps optimize reliability and endurance while providing a .44% AFR rating with a 5-year limited warranty. To make sure your data remains safer within, the Pulsar drive leverages Seagate’s enterprise storage expertise which helps it prevent data loss just in case of a power failure. 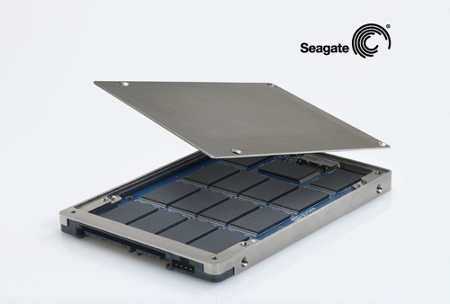 Seagate has already started to ship Pulsar units to selected OEMs in September 2009, and the company holds the distinction of being the first enterprise HDD vendoe to deliver an enterprise-class SSD solution. Gues we are all looking forward to what the Pulsar can do for those with large organizations and want nothing more than reliability as well as performance crammed in a single solution, eh?